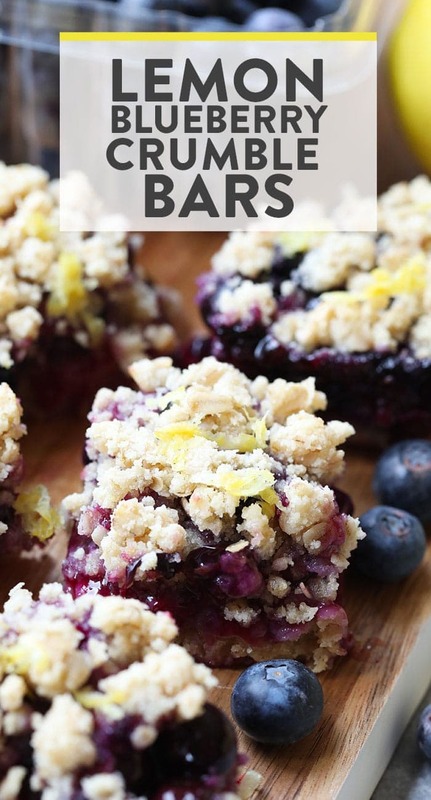 These Lemon Blueberry Crumble Bars are gluten-free and made with whole and healthy ingredients. You can’t beat the refreshing punch of lemon zest and the sweetness of the blueberries. These blueberry bars are the perfect blueberry dessert recipe to eat all summer! Can we please talk ALL THINGS Lemon Blueberry Crumble Bars? These delicious dessert bars are seriously one of my favorite things to make in the whole wide world. There’s just something about blueberries and lemons together that make me all giddy inside. 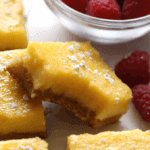 This is such a great dessert bar base recipe to use to deviate with different fruit flavors. I’m thinking cherry, strawberry, raspberry, etc. The list goes on! Crumble Bar recipes may look intimidating to make, but it’s actually quite easy. Think of it as a two part recipe. You’ve got your delicious crust and crumble and then the fruit filling. Let’s talk crust, first. Crust tip: If you’re hoping to keep the crust 100% gluten-free, make sure that you use certified gluten-free oats. And, if you’re wanting to keep this recipe vegan, you can sub maple syrup in for the honey! Filling tip: try swapping the blueberries out for a different berry or fruit for a yummy, creation of your own! We recommend storing your crumble bars in an airtight container in the fridge. These will last you anywhere from 3-5 days if you don’t eat them first! 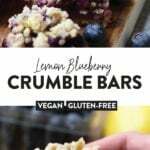 These Lemon Blueberry Crumble Bars are gluten-free and made with whole and healthy ingredients. You can’t beat the refreshing punch of lemon zest and the sweetness of the blueberries. It’s the perfect healthy dessert bar recipe for all summer long! First, preheat oven to 350ºF and spray an 8×8-inch pan with coconut oil cooking spray and set aside. Next, mix all crust/crumble ingredients together in a medium/large mixing bowl. Then, take 2/3 of the mixture and press it evenly onto the bottom of the oiled 8×8 pan. Set the rest of the crust/crumble mixture aside (this is what you will use for the crumble topping). Bake crust at 350ºF for 10 minutes. Remove crust and set aside. Next, place all ingredients for the berry filling into a medium sauce pan. Turn heat to high and bring filling to a boil, stirring often and breaking up the blueberries. Once boiling, turn heat down to low and let simmer for 10-15 minutes. Continue stirring. Once the berry filling has thickened, pour on top of the crust. Spread the rest of the crumble mixture over the top of the berry filling and then bake for another 10 minutes at 350ºF. Let cool for 20 minutes before placing into the fridge for at least 2 hours to let the filling set. Slice and enjoy!